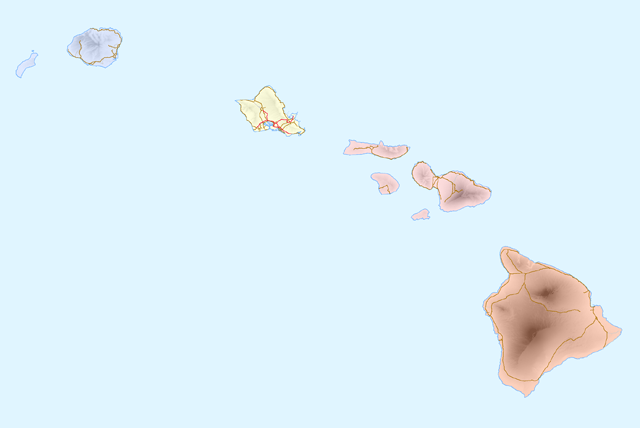 Sitemap to all pages covering the state of Hawaii. Photography by Kevin Trinkle, Larry Epstein and Alex Nitzman. The numbering of Hawaii State Highways utilizes a cluster system based upon island which they are found. Highways in the 100s and 200s or those between 11 and 19 are found on the Big Island of Hawaii. Maui is home to routes numbered in the 30s or 300s. Molokai and Lanai use routes numbered in the 400s. Kauai follows with routes in the 50s and 500s. Oahu rounds out the numbering with highways between 60-99 and the 600s and up. Hawaii County Highways utilize the same route clustering of their state route counterparts. Most spoke from the parent state route and utilize a 4-digit numbering where the first two numbers are those of the parent. When signed, the county highways utilize the same shield style as regular state highways. However, most county highways are not posted and exist as local access roads or residential thoroughfares.